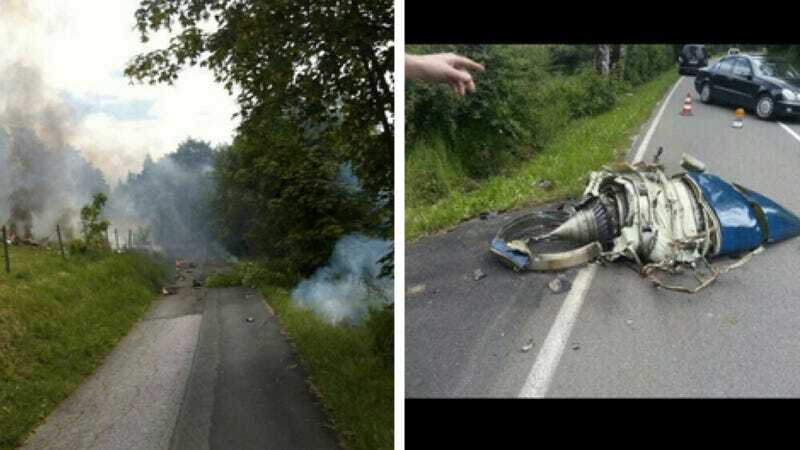 A Luftwaffe Eurofighter jet collided with a Learjet over Oslberg, in Northwest Germany today. Photos shared to Twitter show the burning wreckage of the Learjet on the road and hillside. "I had heard the jets. We live here in a low-fly zone. Suddenly, there was silence. It was quite strange. Then we saw the vast field of debris - only 20 meters from residential buildings. That was really close." German Military spokesman Joerg Langer confirmed to the Associated Press that there had been two Eurofighter jets operating in the area, and that "contact" had been made with the Learjet. The Learjet had two passengers on board. The Eurofigter was able to make it back to its base in Nörvenich, near Cologne. Another Eurofighter incident occurred on June 9th, when one of the aircraft crashed at Moron de la Frontera military base, near Seville, Spain, killing the pilot. UPDATE: The BBC reports that the Learjet was also participating in the exercise with the two Eurofighters. UPDATE 2: German newspaper BILD reports the three jets were going through a simulated hijacking scenario. The Eurofighter pilots were trying to make visual contact with the Learjet pilot when the collision occurred.